Allmaster Home Services is a leading source for pergolas in the Pasadena, Maryland, area. As a family-owned and -operated company that has served the region since 1987, we have earned a reputation for providing beautiful and long-lasting outdoor home improvement products that homeowners across the region rely on to transform their outdoor living areas. Whether you are looking for pergolas that will be the hub of your exterior landscape, or simply want to create an area where you can enjoy some shade on hot summer days, Allmaster is sure to have exactly what you are looking for. We proudly offer pergolas in a variety of different materials to best suit your functional and aesthetic preferences. All of our structures are incredibly durable and will withstand whatever Mother Nature throws their way. Plus, our pergolas offer superior sun coverage when compared to similar products, so you can spend time outdoors even on the hottest Maryland days. 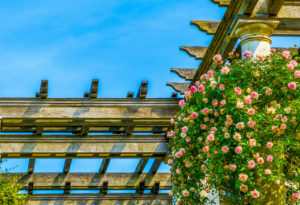 Regardless of what kind of pergola you choose for your home, you can rest assured that it will last for years to come. That’s because all of our structures are installed by extensively trained professionals and are backed by a leading warranty. To learn more about the pergolas we can install for homes in and around Pasadena, MD, contact Allmaster Home Services today.